These pages will chronicle the on-going construction of a fully aerobatic homebuilt biplane. The Steen Skybolt is a homebuilt design that has been around since the early '70's. Larger, and with more wing area than the Pitts S-2 it was originally modelled after, the 'Bolt has been, and continues to be built in large numbers. When I made the decision to build mine in early 1999, there weren't any real alternatives in the market. 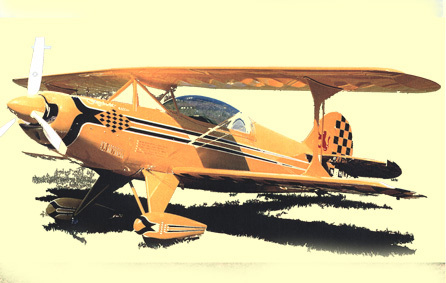 I wanted to scratch-build a 2 seat high-performance biplane, with a proven safety record. Steen Aerolab (sellers of plans and components for the Skybolt) then owned by the late Hale Wallace, is well renowned as a reputable and reliable company. That is an important consideration when you are undertaking a project that can easily span 10 years and a large part of my decision to build from plans rather than a kit. Plans were ordered in February '99 and rib construction started shortly thereafter. Steel was received in April of that year, and work began in earnest. The fuselage went together rapidly and by August it was ready for final welding of the truss. The fuselage was then inverted and work began on the landing gear. A jig was built along the lines of that in the notorious "Skybolt News" and soon my fuselage was on wheels. Up right again, the cabane structure was built next, again with a jig from the "News." The tail surfaces were next, and in my opinion were the most challenging part so far. Getting a smooth bend that was still flat edge-wise in the 7/8 x .049 tubing used in the horizontal stab was not easy. After a lot of contemplation I bent the tubing with a conduit bender, checking it against an outline drawn on my work table. I'm convinced it's an art to bend tubing. Controls were next up and went together very fast. The torque tube wasn't nearly as difficult as the 'needle-bearing boys' would have you believe. The rudder pedals as designed took a lot of timevery high parts countand are heavy. I finished most of the trim system, although I have yet to locate the hinge material for the actual anti-servo/trim tabs. The walking beam was construced according to plans, and minimum control throws are barely acheived. I will probably rebuild it with one leg longer to achieve longer throws. I have formed and fit the sidewall and belly formers, as well as the instrument panels and turtledeck. Wing construcion is well underway as well. All ribs are built, and the spar material has been obtained and milled to proper shape. As of this writing, the lower wings are structually complete, save for the leading edges which will be made out of plywood.I will be incorporating the SS ailerons designed by Curtiss Pitts for the Skybolt. This will greatly enhance roll rate and should provide equal forces inverted and upright. Also, the ailerons will be enlarged one rib bay, and 3 hinges will be used vs. 2 in the original plans. Boy, it's been a long time since I've updated this! I just completely re-did my main site (http://bretwills.com) and orphaned this one. I plan on completely updating this site soon with new pictures and better layout. We've had a lot of things happening that forced the project off to the side - every few months I'll hack away at something though. We had twins, which took away a lot of building time, and we bought a 1953 Cessna 195, which took away any spare money for parts.